no, i have not received the case, free is free though. i have not used the smokies before so i can't compare, i like the gizeh, but 2-3 have hinge probs after ~5 months. The other day, my wife came home from the tobacco store with a new Smoky case. I immediately cabbaged onto it and noticed that something was different. The hinges are much stiffer and it was more shiny than others I have purchased over the years. I began to examine it more closely and found that it says "Made by AK" and no longer says "Made in Germany" on the bottom. I had hoped that it might not peel like the others, but as I was writing this I found a spot that has already started to peel. Hey Tim, long time. I had noticed the change (lost in the site update, found and fixed). I don't care for the tighter snap of the new ones. It would be interesting to know where they are made now, it may have resulted in a price decrease (under $2 now). Thanks for the updates on hinge failures (below). I've had a few fail myself, not enough to bother me though. I stumbled upon some tiny little metal hinges at a crafts shop once...about 3/4 inch long and not very wide. I epoxy-resined two to a Smoky that had suffered hinge failure (one at each spot the original little plastic "hinges" had been) and I'm still using the sucker after two years. Now if I could just remember where I got those two from.... I have three or four Smokey's floating around sans hinges. 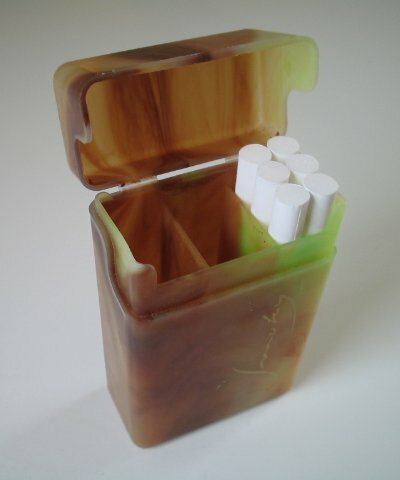 I have found that my Smoky cases tend to peel mostly when in contact with solvents or certain other plastics. I used to work around acetone (cultured marble industry) and the Smoky would start to peel tremendously even when only in contact with the fumes from acetone. Also, I like to fish and today I went for the first time in a while. I placed a small soft plastic lure body in my shirt pocket with my Smoky. When I got home, I noticed that the case had started to peel where it came in contact with the lure. I have several of the "new" Smoky cases (AK) and I like the tighter snap, but the plastic in the new and the old cases seems to be very unstable in the presence of certain substances, even the fumes thereof. BTW, and this will probably unmask me, I caught 14 black crappie. All were legal size, but I would have only kept 12. Didn't keep any. These are the best cases, although they will peel layers off the outside.after being used for a while. And of course it's hard to resist picking at the peeling, which makes it worse. While a full Smoky case usually does me for a day, I really like the convenience of having a lighter in the case. Its made from 1/4" plywood and a Cricket lighter (a bit of double sided tape holds it on). The insert shows how it can be positioned for easy access to the snapping child-proof button. I don't know of any other lighter that would work well in this application. The hinge, on the first Smoky case I bought, failed today. Two years and nine months of nearly everyday use. Not to shabby. I'll bet being the locking tabs are on each side of the case you can still 'lock' the top on the case for home use or storage but not for carrying. I assume you are using more than one Smoky case? I bought 10 for $25 around 15 months ago and all are doing just fine. Two swivel with less effort so I assume they'll be the first ones to die but that could be awhile. I can be rather rough with them and one case has peeled slightly - almost like a protective layer peeling off but just in one area. Another one broke the other day. They lasted longer than my SS case for my 100's though. It died last week also. As a duct tape artist. Have you thought about duct taping the lid back on? That is my plan when and if my smokies hinges fail. Does the lock on each side of the front of the case still hold even with the hinge broken off? I'am wondering because some of mine are getting flimsy but I hope I can still us them for 'at home' use. Ok, so the case in my post above was my wife's and, of course was usually carried in her purse. I switched to kings in March and bought a Smoky just for me and carried it every day in my back pocket. I got a little more than four months out of it before the hinges broke. Of course, I'm really hard on stuff. Filter up for me with the Smokys. Easy to do since it has three compartments. I also stuff 100's for the spouse but since NOBODY makes a decent case for 100's, I re-use old premade 100's flip-top boxes. Since there isn't a compartment, I stuff those filter down. I put the smokes in; filter down. I love these boxes for the separated areas. I can occasionally tap the box to pack any tobacco that comes loose in my adventures. I don't smoke that much and like to carry at least two types of SYO smokes with me. That was pretty old. I don't where/if you can anymore. Its surprising and unfortunate that more folks don't stock them. $2.50 each if bought in a bulk pack of 10 from D&R. I recently switched from 100s to king size due to tube selection/quality and lack of 100 size cases. The dividers are nice since they make loading 6 tubes per section a breeze. The cases are crush proof and specifically built for the SYO tube diameter. The cases are in varying psychedelic colors for those of us from the 70's. $1.90 each at American Thrust. These are great cases.......... after one year never had one break but they do get scuffed up... so I just ordered 4 more ,,, with the savings on tobacco, I can afford good looking cases. I am still using zigzag cases. What are the reports on the Smoky cases. How long does the hinge top last? I reload (ammo)and use a lot of plastic cases,sooner or later they break. Midway brand,RCBS,Berrys,MTM have always replaced the case's,free of charge. What is the warranty on this cases?? I've got 8 of them. The first one I bought is a month shy of 2 years old. Some of the hinges are a tad frayed/worn but none have broken, or look like they are about to break. I'm not aware of any warranty. Hi all! I've used all from mint boxes to small plastic zip bags for my cigs & even the two piece blue plastic boxes fail at times by slipping apart in a hip pocket. The one piece hinged 'double lock-click' are good & air tight BUT like all non divider cases seem to bend inward in the middle & cause headaches. WITHOUT reservation I have to go with the smoky case with the dividers, even up here in cold country (WI) the hinges have not been a problem carrying the case in the outside jacket pocket for extended periods outdoors in cold minus 0 temps. I also use them as a color code for trying new blends. I just bought a Smokey Case for my wife and she loves. I am just concerned about the life span of the case due to the plastic hinges. They look like to me that they will eventually break from repeated stress. Also do they come in 100's size. 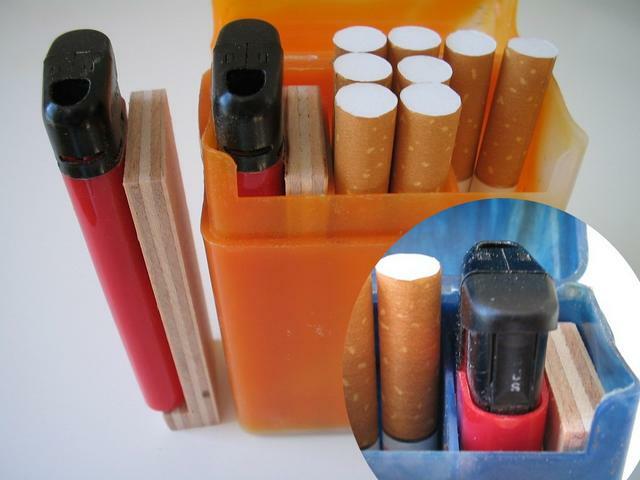 I've been using the 'smoky' cases for some time (2+ years) with no problems; the only thing I dont like about them as I fill 5 or 6 packs in a sitting the although small but open area in the back hinge area could lead to some drying, I know that sounds picky but yet the only other case I use is the black double click front closure type case (yes, non-segmented inside but easily store 17-18 cigarettes) that I use more to store different blends I may be trying & store in a cedar cigar box that helps the packs from any more drying that may be normal to our RYO/MYO's.